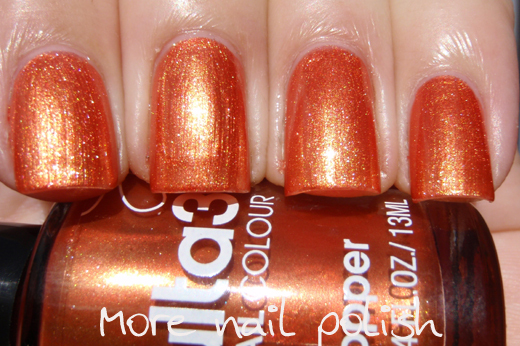 I have a quick break my posting my Lynnderellas to bring you some swatches I did on the weekend of the new Ulta3 Autumn/Winter 2012 Metallic Crush collection. The promo pics of this collection were on the Ulta3 Facebook site in late February. 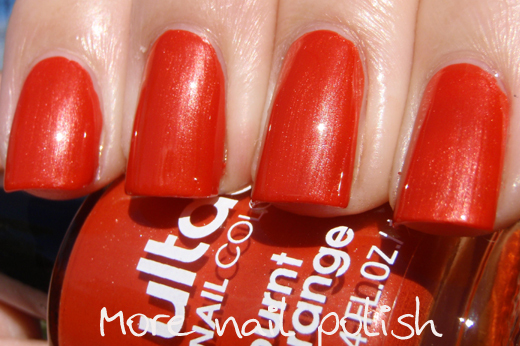 Since I saw them I started my usual hunt to find these polishes. I think I ventured into every single chemist in the City, Belconnen and Gungahlin in search of this collection. Every time I asked, the sales assistance looked at me dumbly and just said 'Oh we just get what we are given, we don't know what will arrive and I don't know anything about a new collection". I eventually emailed the Heat Group to get a list of all Canberra stockists so I could hunt these down. Their customer service was great, and they got back to me the next day to tell me that not a single chemist in Canberra had even ordered the new collection yet. They offered to post me the new collection for review, which I gladly accepted for the first time ever! I'm guessing the reason that none of the Canberra stockist had ordered anything yet was because their 'bins' were all still full on the old colours. And now, because Ulta3s are being sold in Coles and BigW and that the dupe NYC colours are in Woolies and BigW, that the polishes in the chemists aren't selling as fast anymore. Thus not clearing stock to make way for the new stuff. 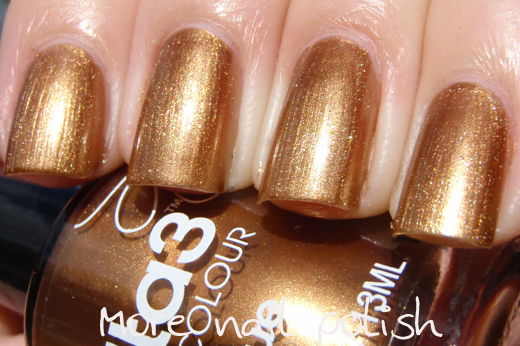 Anyway, enough on my dramas trying to get these polishes, lets just get of with swatches of the first four polishes. 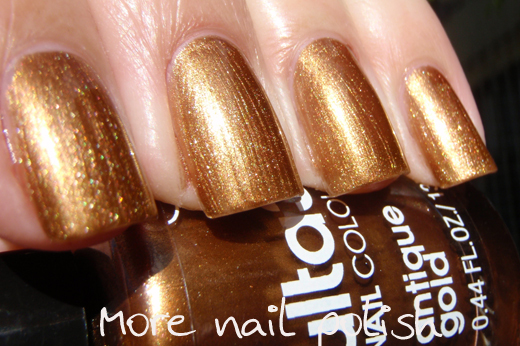 Antique Gold - A warm toned bronze gold metallic polish, that leans a little frosty. It's not as frosty as Gold Rush Fever from last year, but you still need to be careful and do neat brush strokes because they hang around after the polish has dried. I've said it before with the last few collections that have been made in the PRC, but I'll say it again. These brushes feel stiff and crappy. They really seem to exacerbate the brush stroke problem, because the brush is stiff and really drags through the polish. 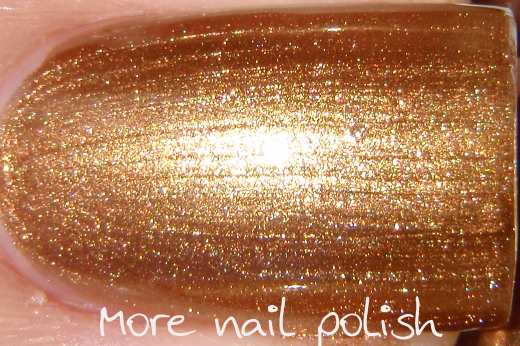 Despite the brush stokes, this is a gold polish, which for that reason alone, I'm always going to love. The above photos were all taken in full sun, in the sun the brush strokes look worse, below you can see it in the shade - pretty. And the macro to see the lovely shimmer and hideous brush marks. 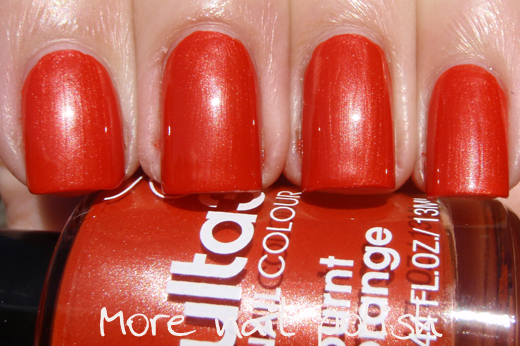 Burnt Orange - This one is a dark orange with a light silvery pearlesent sheen. It's not really metallic like the others in the collection, but the crappy brush still makes it show brush strokes. Above in full sunlight, below in the shade. Again, macro to see the pearl finish amongst the brush strokes. 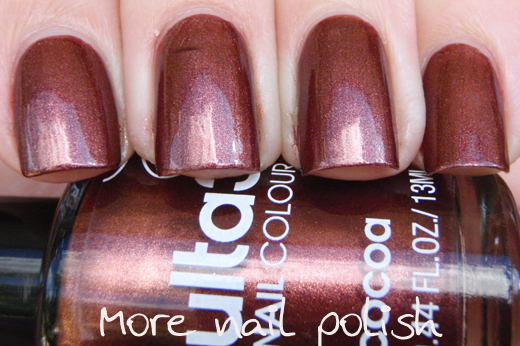 Cocoa - A dark, warm chocolatey shimmer. Please disregard the line on my middle finger, I put the top coat on too quickly and it dragged the base colour. User error! 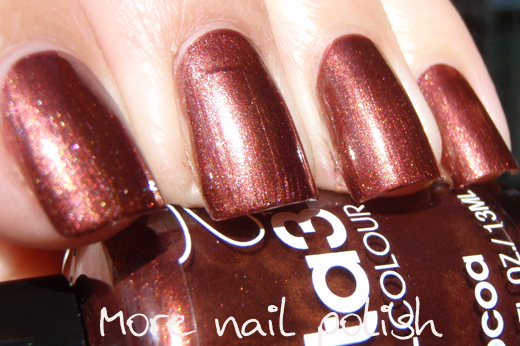 Copper - A copper toned orange with a lighter pearl sheen. It does look metallic in the sun, but in the shade it is much more pearly looking. The brush strokes weren't as bad for this polish. 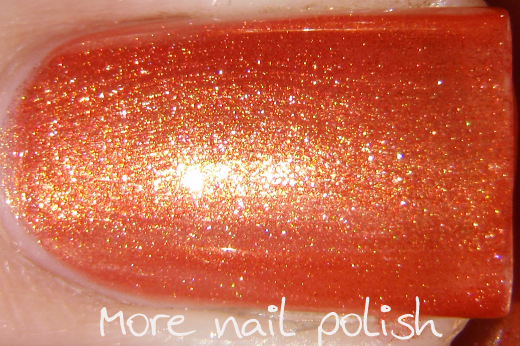 Damn macro, I just said that the brush strokes weren't as bad for this polish and now look what I'm showing you. 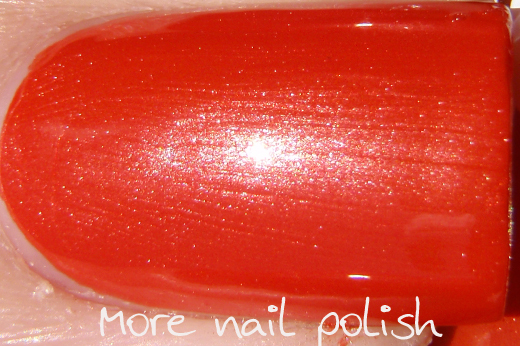 Yeah, brush strokes (and wobbly ones at that) are definitely present, although not a strong as the other polishes. Colour wise, I think this collection is pretty spot on for Autumn/Winter. I actually really love the colours. Formula wise, it's not great. I personally can tell a difference between these PRC made ones and the older Aussie made ones. But I'm not sure if I'm putting blame on the formula because I find the brush crap. All these swatches were two coats, no base coat and Seche Vite top coat. Despite being metallics and having a frosty finish, I don't think any of these would be work for stamping. I'll be back next time with the other four colours. Cocoa's my pick. I love the slightly purple shimmer in the macro shot! I think I'm picking Cocoas as the undies for an upcoming Lynnderella! These are all stunning, I wish I could get them in the states! 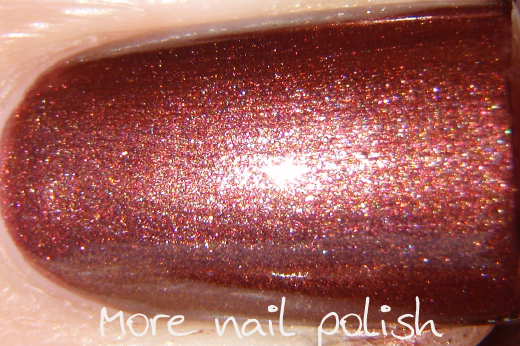 LOL this is probably one of the few polishes that we have in Australia that would be near impossible to get unless you swapped with an Aussie. But just think of all the awesome drug store brands you guys have! I swatched mine on the weekend too! :) I favourite was Cocoa which I was not expecting. So pretty! I love Cocoa as well! Copper and Burnt Orange are a bit too similar for my liking, as are Pinot and Shiraz... overall the collection's a bit too frosty for me. A bit frosty - Lets just say a LOT too frosty shall we. I had such high hopes for these and I'm disappointed in the finish, but quite like the colours. Lynnderella - I Can Afford It! Nail art challenge giveaway now closed.